Rachel McAdams can safely be called the new ‘girl next door’ actress, taking the place of such stalwart actresses as Meg Ryan and Julia Roberts. With her bright eyes and perfect smile, she is the girl that women like and men want to meet. Her recent theatrical efforts include films like The Vow, The Time Traveler’s Wife and Wedding Crashers. 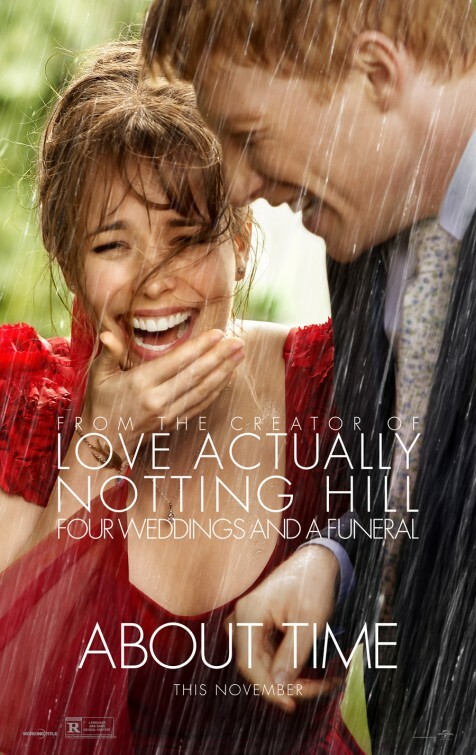 Her latest romantic comedy is director Richard Curtis’ About Time. The tale starts with Tim (Domhnall Gleeson), a geeky 21-year-old who finds out on his birthday that the men in his family can travel through time. His professor dad (Bill Nighy) also has the gift and has used it to read every important work of literature. He is warned that using the gift to make money will only make one unhappy. Tim decides he wants to use this ability to get a girlfriend. He does his first test at a New Year’s Eve party. Tim first falls for Charlotte (Margot Robbie), a friend of his sister Kit Kat (Lydia Wilson). He finds that both time travel and women are a mystery. The more attempts he makes toward Charlotte, the more he shows how clumsy he is at the mating ritual. Tim totally fails in his attempt to win her over, leaving his heart broken. Eventually Tim moves to London to become a lawyer and meets Mary (Rachel McAdams) at a ‘dining in the dark’ restaurant. He is totally charmed by her and gets her number once they leave the restaurant. When he goes home, he has to use his time travel ability to save the play of his writer/roommate. When he comes back to normal time, her number is gone. By traveling through time, he has lost the meeting. Eventually, he decides to ‘cute-meet’ her again and finds that in this timeline she has a boyfriend. Tim has to travel further back into time and meets her for the third ‘first time.’ Very soon Tim and Mary are dating. The rest of the story is their courtship, meeting the families and having a beautiful rain-soaked wedding. Throughout all this, Tim tweaks his life to make the details perfect. He also finds that when he goes back too far, major events in his life change. He also finds that kids change his abilities to travel back. About Time is a thoroughly enjoyable little autumn flick. It wraps around like a warm blanket. Though it is a time travel film, it is much more a film about family and the bonds between fathers and sons. For those expecting science fiction, this is not your film. This production revels in the concepts of romance. Writer/director Richard Curtis has been behind such productions as Black Adder, Notting Hill, Pirate Radio and Love Actually. He has walked the edge of side-splitting comedy and tender romances. Here he leans on the romance side, but there are many funny moments throughout the screenplay. The work swims back and forth between the two extremes gracefully. Perhaps the most brilliant part of the screenplay is how every character, no matter how minor, is unique. He gives us a giant palette of individuals, all of which could be in their own film. There are co-workers and family members who are quirky and endearing. These fine details are what make this film. Another thing Richard Curtis does is capture London in a perfectly romantic light. Even thought is it a wonderful city, full of stunning history, he captures the bustle of the world while still showing the smaller aspects of the city. It is a richly detailed capture of one of the world’s greatest places. Rachel McAdams could read the phone book and still be just as charming. She could become the biggest star of the romantic comedy genre. She breaths new life in the stale format, making one believe that true romance can and does happen. Besides, who can resist that pixie smile? The real find is Domhnall Gleeson. The former Harry Potter actor shows that he can handle the majority of a film without being overwhelmed by the process. He has a certain simple charm that will win the audience over. But easily the best scenes are between him and Bill Nighy as the father. When they play table tennis, one really feels the special bond between these two. The idea of About Time is that ‘Life’s a mixed bag’, but the film is a winning, soppy romantic jumble. It is thoroughly enjoyable movie experience that will send in women by the droves. But for the guys who are dragged along, it will still be a charming little feature.